Cycling with Muggs is predicated upon notifying Bank Teller if you materially disagree with any clause(s) in Muggaccinos' "Ride Participants Liability Acknowledgment"
Never cycle two abreast on a single lane road with an unbroken centre line, 'cause RTA deems those sections provide inadequate visibility for a motorist to overtake an vehicle ahead. [N/W side of station - 70 m Nth of Railway Hotel in Jersey St] for 35km to Mt White. · 8:05am rollout for the 50km route from Berowra station carpark cycling Nth up Old Pacific H'way to Road Warriors' Cafe Mt White. 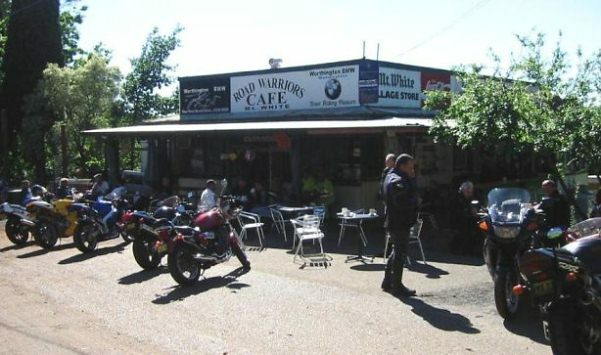 Both groups arrive 1st Nosh Stop - Mt White Road Warriors Cafe with Segafredo Zanetti (30 min) from 9:25am. 9:55am commence return leg, South down Old Pacific H'way with 2nd Nosh Stop (25 min) at Pie in the Sky from 10:45am amidst the ambience of the Verdant Grassy Knoll overlooking the majestic Hawkesbury River. With Martin aka Architect not far a drift. but "centre-stage" Martin aka Al Capone probably ain't fazed about some heads getting chopped out. What a noggin!! !